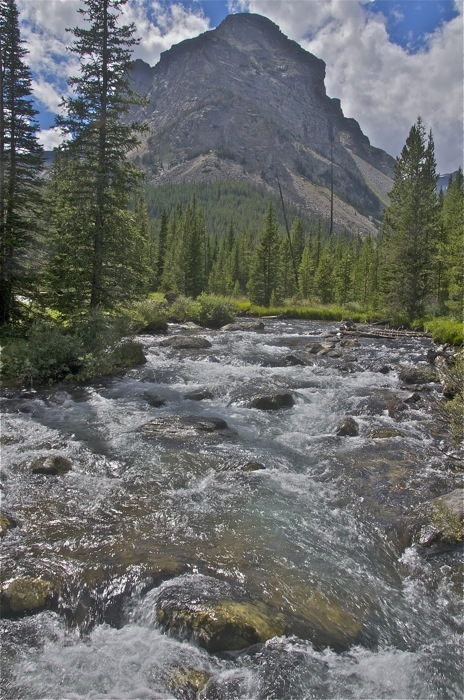 Just northeast of Yellowstone is a vast alpine domain of Montana’s highest and most spectacular peaks. We’ll be backpacking in the Absaroka-Beartooth Wilderness in the Custer -Gallatin National Forest. 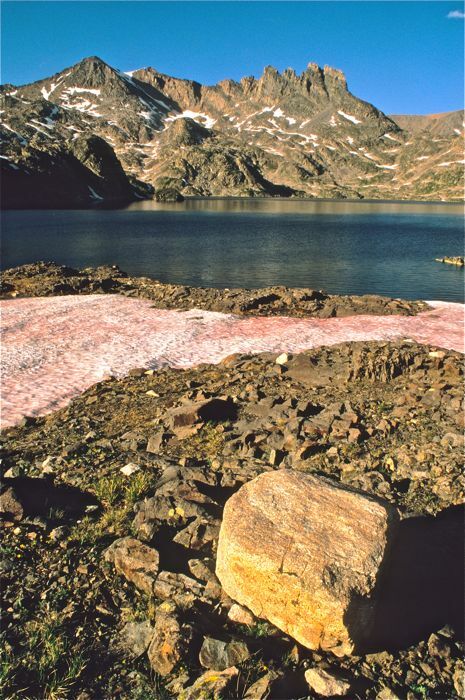 Glaciers, alpine tundra, and hundreds of clear, icy lakes characterize this high-altitude wilderness. Subalpine forests of spruce, fir, and whitebark pine are interspersed with flower strewn meadows. The granite peaks are spectacular, and we may see mountain goat, bear, moose, and other wildlife. Portions of our trekking route will be off-trail and above tree line. When backpacking here, prepare for any kind of weather on this fairly strenuous trip based in Bozeman, Montana, unless we tell you otherwise. The Absaroka-Beartooth is one of our larger Wilderness areas, and one of the most spectacular mountain regions to explore anywhere. It includes landscapes of valley, mountain, lake and streams that lie entirely over 10,000 feet in elevation, and it may be the closest thing to Arctic Alaska that one can find in the temperate latitudes of the lower 48 states. TREK BASE: The Bozeman Comfort Inn is at 1370 N. 7th (406) 587-2322. They will store your luggage while you are out on the trail. We have worked with this motel as our in-town base for decades. MEETING TIME: Pre-trip orientation plus food and gear handout and safety talk at 6 PM the evening prior to the first day of the trip at the Bozeman Comfort Inn unless notified otherwise. TRANSPORTATION: Major airline service to Bozeman; the Comfort Inn has an airport shuttle (call them in advance). TREK RATING: This trip is fairly strenuous at high elevations with lots of off-trail hiking and backpacking. ELEVATIONS: 8,000 to 11,000’ with higher altitudes possible on day-hikes. Maximum one-day elevation gain with backpack is 2,000 to 2,500’. Due to high elevations, we recommend that if possible, arrive in Montana a day or so early to begin acclimation. WEATHER: Sunny mornings with clear chilly nights are typical, but afternoon thunderstorms can build up quickly. At these altitudes we must be prepared for anything from cold rain and snow to 80-degree heat. SPECIAL FEATURES: Absolutely gorgeous alpine terrain, with glaciers and Montana’s highest mountains including Granite Peak at 12,799’. A variety of wildlife typical of the Greater Yellowstone Ecosystem, though big animals are less abundant at these high elevations than they are in lower country. Expansive alpine tundra plateaus with hundreds of icy lakes plus spectacular wildflower blooms; the Beartooths boast an unusual diversity of alpine and subalpine wildflowers in a true high mountain wonderland! SPECIAL TIPS: There are bears, so leave deodorants and other good smelling things at the motel. 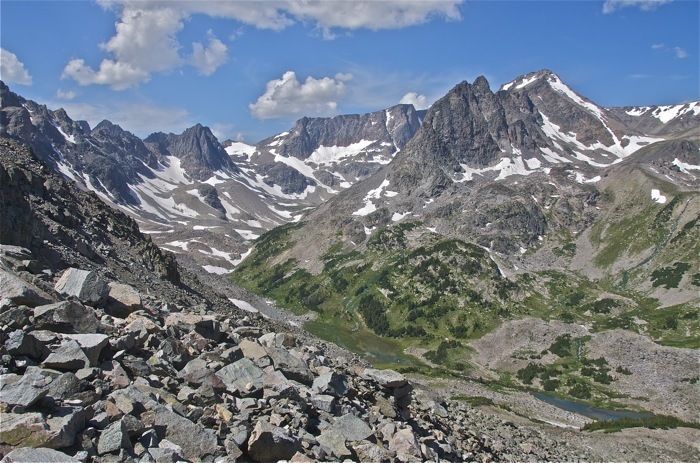 CONSERVATION: Most of the Beartooths are within the protected Absaroka-Beartooth Wilderness. However, climate change and other assorted affronts to good wilderness stewardship challenge us to keep the Beartooths pristine. The western half of the southern Wilderness boundary abuts a wild portion of Yellowstone National Park. 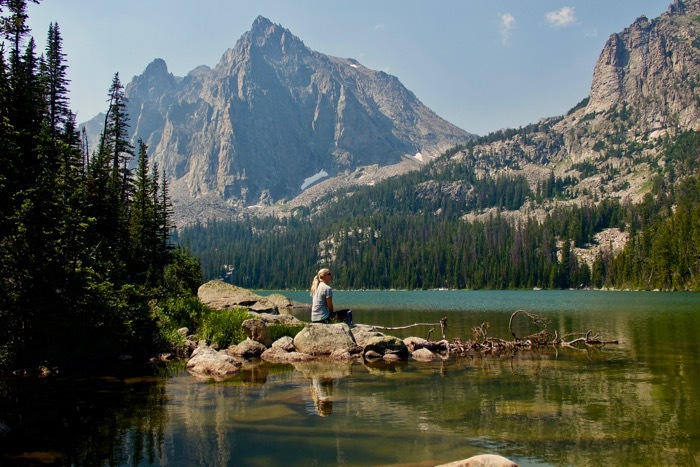 Big Wild co-owner Howie Wolke helped to get the Wyoming High Lakes area added to the Absaroka-Beartooth Wilderness in 1984. ITINERARY: We’ll vary the route from year to year, but expect at least a 2 to 3-hour drive to the trailhead from. There is usually a mid-trip layover for day hiking or relaxing. Some routes are loops in which we end up either at or fairly near the original trail-head; others are “point A to point B” in which we arrange a vehicle shuttle. This trip is operated under special use permit with the Custer-Gallatin National Forest. 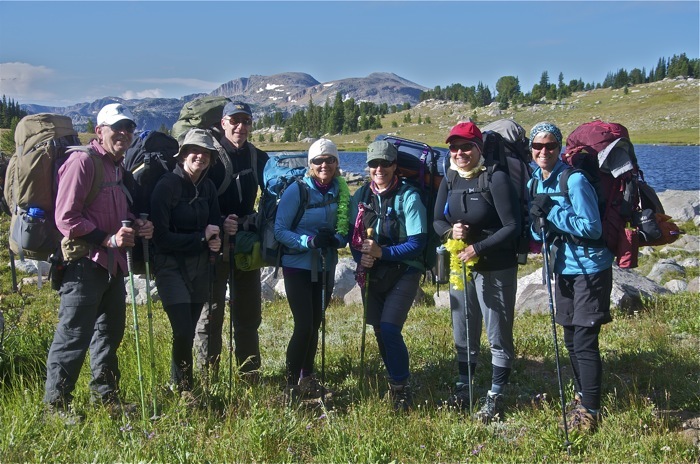 Return to the main Montana backpacking trips page to view other related guided tours.